For those that love to fly fish like I do... don't turn your nose up at an opportunity to visit Branson Missouri. It is undoubtably one of the best places in the country to go for family entertainment... the great flyfishing is an added bonus. The fisherman depicted on the left took me about 15 seconds to to spot... the flyfishing is that good on Lake Taneycomo. And you do not have to be an expert fly fisherman to enjoy it... more on that later. 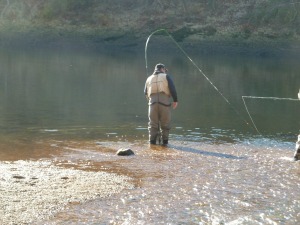 The reason that the trout fishing is so good on Lake Taneycomo, is that it is a tailwater produced by Table Rock Dam...there is a difference of about 200 feet between the water level of Table Rock Lake and Lake Taneycomo... the water temperature in Lake Taneycomo is a trout friendly 42°F. 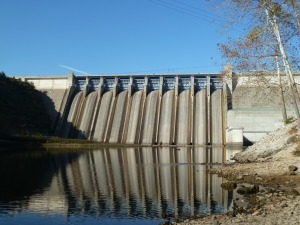 Table Rock Dam was completed in 1958... flyfisher persons have been rejoicing ever since. If you like to wade fish, like I do, you are subject to the whims of the Army Corps of Engineers...and the power generation schedule that they control. The best wade fishing is when none of the four generators are running...a word of CAUTION, when you are wade fishing and you hear a long siren that means generators are being turned on and you should start heading for the shore. If you are in Branson for a week chances are you will have several opportunities to fish no matter what the season... so there is good fishing to be had year-round. 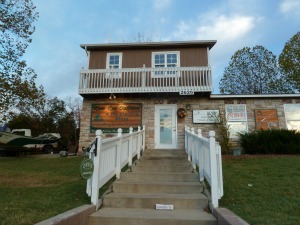 My favorite fly shop in Branson is River Run Outfitters, it is conveniently located less than half a mile from the public fishing access near Table Rock Dam. It was recognized as the Orvis outfitter of the year in 2006 and 2007... as well as being named the outstanding small business of the year by the city of Branson. It is no accident that River Run Outfitters was recognized for their excellence... they offer very friendly advice, an outstanding guide service, and they have a fully stocked fly shop... make this your very first stop before trying your luck. 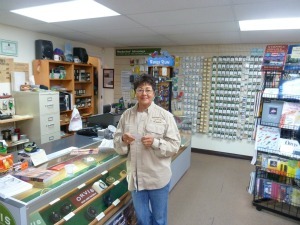 I said earlier that a rank beginner can enjoy flyfishing in Branson... and here is the lady, Carolyn Parker, that can introduce anyone to flyfishing...WARNING flyfishing can become extremely addicting... but that is a good thing. At Carolyn's shop you can hire a guide, rent equipment, and get her up-to-date advice on which flies are working the best. Incidentally, Missouri is one of the least expensive places in the country to fish and offers daily licenses for nonresidents at seven dollars a day...here is more info on licensing. I know of what I speak, the yearly nonresident fishing license in Oregon which I visit every year is a budget busting $106... at $49 a year, including your trout stamp, Missouri is a bargain. Branson is best known for its many theaters that offer wholesome family entertainment... up to 50,000 people can be visiting Branson at any one time. 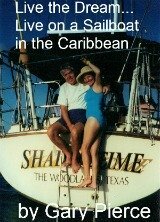 It's a great place for a family reunion, being centrally located in the United States. The great flyfishing is an added bonus. I hope you have enjoyed reading flyfishing in Branson.